Enemies in roguelikes have all the fun. They get to roam around vast dungeons chatting to their similarly evil mates, hoarding gold and equipment, and slapping down the occasional adventurer that wanders foolishly by. I'm intrigued by this roguelike that lets you be the enemy, then, firstly in a lowly imp form, and secondly by possessing your rivals' bodies, and using their demonic powers against their kind. 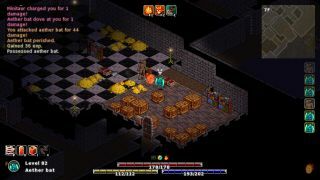 Isometric death labyrinth MidBoss released a few days ago, and its Big Thing is the ability to transform yourself into a variety of monstrous forms. "Kill your enemies, possess their bodies, and take their abilities as your own in this turn-based procedurally generated death labyrinth. You play as the imp, the weakest monster in the dungeon. Tired of being bullied by the other monsters, you set off with your sidekick Mid to descend to the deepest levels of the dungeon, defeat the final boss, and take his place." Which is just a really cute premise. Despite the permadeath, there is persistence in the form of Death Cards, which drop when you die. You can spend these to "start your next run with items you had when you died", or load them up to look at your stats, or to play using the same seed/settings. You can even customise them with "unlockable themes". You can grab MidBoss from Steam, where it'll set you back £10.99.